The observance of Holy Week services developed in Jerusalem in the fourth century. Pilgrims to Jerusalem brought the services back home and incorporated them into their local worship. These services then provided the structure for the celebrations of Holy Week. The devotional services of this week are an important part of our Anglican tradition. Come join us for any or all of them! 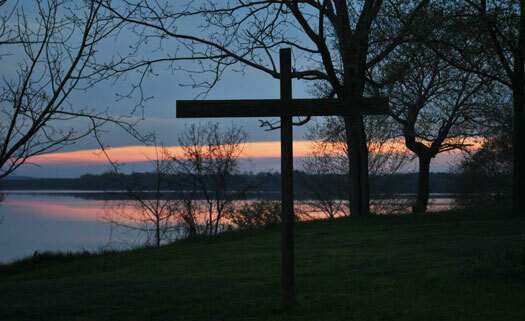 Tenebrae (which is Latin for “darkness”) is based on the ancient monastic night and early morning services during the last three days of Holy Week. Our Book of Occasional Services has drawn elements of all these services together so that we can share in “an extended meditation upon, and a prelude to the events in our Lord’s life between the Last Supper and the Resurrection.” The use of Lamentations, Psalms that Jesus certainly would have known and prayed during his last days, and the extinguishing of candles throughout the service provide a powerful entrance into the events of Holy Week. One of the most dramtic services of the year. The name Maundy Thursday comes from the Latin “mandatum,” and refers to the new commandment that Jesus gives to us. Leonel Mitchell tells us that this service ties the events of the Last Supper to the events of Good Friday, and connects the Eucharist with the sacrifice of the cross. The Good Friday liturgy gives us the opportunity to remember and participate in the events of this day—our salvation through the victory of Christ, who by dying, destroyed death. This service includes the veneration of the cross, a custom which also dates back to the fourth century. This community service, sponsored by the Ruritans, gives us the opportunity to worship and then to share breakfast with our Port Royal neighbors. The Easter Day service is the principal celebration of the church year. Please plan to attend and celebrate our Lord’s glorious resurrection. Everyone will gather for the lighting of the Paschal fire in front of the church at 10:45 AM. Our service will feature festal music featuring the voices of our choir. We will also have special organ music from Brad Volland and a trumpeter in the service.